I love this series, I am known to be a sucker for faery stories….and this series not only has the Summer Fey and the Winter Fey, but also the Iron Fey which have been created because of the human use of technology which is becoming greater and also because there are less humans believing in faery tales. The Fey can only stay alive while humans believe in them. But I digress. 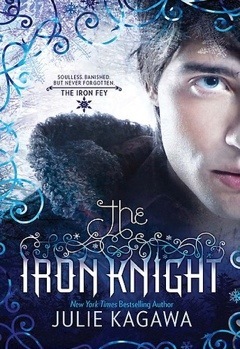 The Iron Knight, is the final book in the series and for the first time, we get a book told from the point of view of Ash, a winter prince, an iron knight and a boy in love. I was hanging out for this book so much, because I truly loved Ash in the first three books. I loved his interactions with Puck (well known Robin Goodfellow), I loved his ice cold emotions that warmed for Meghan and I loved watching their relationship develop. Meghan does not really have a voice in The Iron Knight until the very end and I found that I missed her. In saying that though, the action and adventure throughout the story was fabulous. The journey is long and hard with the objective of Ash becoming mortal and getting a soul. Both Ash and Puck battling away to get to the ends of the earth, reminded me a bit of Labyrinth. With the help of Grimalkin, a regular in the series and also Big Bad Wolf (who I have a special place in my heart for) Ash and Puck have a variety of helpers on their journey. There is also another secret, special helper who I was in two minds about…didn’t particularly warm to this character! There were many fight scenes, lots of witty conversation, self reflection by Ash and a little bit of swoon. This book was a great way to end the series and I can easily say that the Iron Fey is one of the best series that I have read this year.